Come Join us For Fun Friends and Learning! All ages! We will have an educational workshop with a new subject theme each month. Participants will be encouraged to display their works at the library. Parents are encouraged to network and share ideas and curriculum. 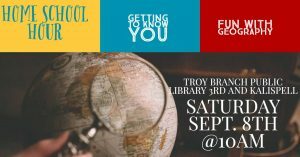 10 am at the Troy Branch Library!